I was having a look through my mass of Christmas stamps trying to decide what to use and I came across a very old and uninked stamp set from Hobby Art - Rudolph was feeling very neglected so it was time to ink him up. I kept my card pretty simple as I wanted Rudolph to take centre stage. Don't you just love his big nose and cute hat and scarf set? Thanks for visiting, enjoy the rest of your day. Fantastic bright and colourful card. My daughter has this stamp I must borrow it sometime. Fabulous card Andrea love the image so sweet. 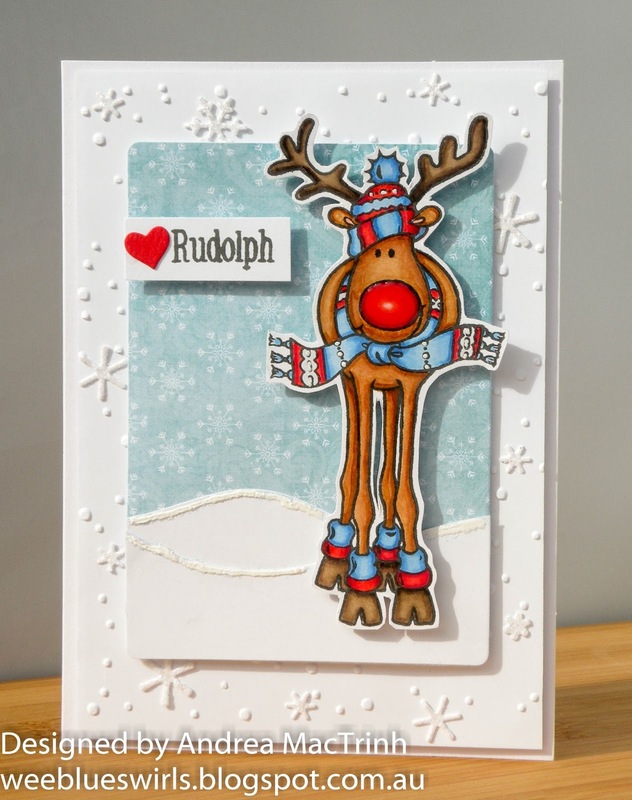 Hello Andrea: Your card is just adorable, little Rudolph looks so sweet with his coordinating knit cap, scarf and leg wormers, he just makes me smile. Love it, thank you for sharing at Merry Monday. PS. if you go see my blog to check my card, please just scroll down to the next post, I apologize for this, but I was linking my blog posts incorrectly, I already fixed this problem. I'm a total newbie and not very techy so, I hope you bare with me. What a sweet image! Love your little details. Thank you for sharing with us at Merry Monday! That is a fun image - love this card. Rudolph definitely needed to be inked up, Andrea! You've colored him perfectly and I love the layout and sentiment! Thanks for sharing this with us at Merry Monday! Fabulous card, I love this supper cute image. Thank you for joining us for Merry Monday. I love this perfect card! The reindeer is adorable and the heart if perfect for the challenge! Thanks for playing Merry Monday this week! Fabulous Andrea! Love your coloring and cute reindeer! Awesome Christmas card, love Rudolph and your CAS design. Thanks for sharing at Merry Monday. ohmygosh sweetest card!!!! thank you for playing a long with us at simon says stamp wednesday challenge! Fun card. Love that Rudolph! such an adorable holiday card! Love this card and what a fab reindeer stamp. I'm going to go on the hunt and see if it is still available. Thanks for joining us at Christmas at Sweet Stampin', good luck and I do hope you'll be back again.